By Dennis Lee Pitts Jr.. In the late 1930s many Americans were fascinated by the news reel footage coming from the Soviet-Finnish conflict. They were amazed by the massively outnumbered Fins daring exploits; ambushing supply columns, capturing supply depots, and attacking much larger Soviet forces and emerging victorious. The Americans were even more impressed that the courageous soldiers from this tiny nation did so in winter white jumpsuits and on skis using them to strike and then fade back into the dense forests and mountains where the Soviet armour and unwieldy divisions could not follow. By the middle of 1940, millions of Americans were wondering if their army was prepared to fight such a war in the cold mountains. FDR referred this matter to the War Department for further study. By September of that year, Minot Dole frustrated by the lack of action, and unaware of the Army’s own efforts, secured a meeting with the Army’s Chief of Staff, General Marshall. During the meeting Dole presents General Marshall with a paper detailing the necessities of winter and mountain training as well as a funding proposal. Dole asked for and received funding to improve the offices and officer corps of the National Ski Patrol. By November, the AAC and NSP were both coordinating with the Army and pioneered several now common items of mountain and wilderness gear; Nylon rope, pre-packaged dehydrated food, and down sleeping bags. The War Department also issued an order to form Ski Patrol units in the 1st, 3rd, 5th, 6th, 41st, and 44th Infantry Divisions. US Olympic Ski Captain Rolf Monson was charged with instructing the first of these units (the Ski Patrol unit for the 1st Infantry Division) at the Plattsburgh Barracks in Lake Placid, New York. The War Department also authorizes members of the NSP to visit the divisions to conduct research and report on problems with their equipment and camping techniques. Noted skier, mountaineer, and former Captain of the University of Washington Ski Team Lieutenant John Lockwood entered active duty with the ski patrol assigned to 3rd Infantry Division. He led them on an exercise in circumventing Mt. Rainier. In March of 1940, he was temporarily assigned to the 41st Division and led them on a two week expedition into the Olympic Mountains. By November 1941, training was authorized on a regimental level and the 1st Battalion, 87th Mountain Infantry Regiment was activated at Fort Lewis, Washington. The new battalion was commanded by Lt. Colonel Onslow S. Rolf, a West Point Graduate with Cavalry and Artillery experience. Lt. Colonel Rolf created the battalion from scratch from men from the 3rd, 41st, and 44th Divisions who had participated in the previous winter’s training. In the following months he worked with Minot Dole and the NSP to recruit civilian volunteers. Dole established a system where a volunteer would present three letters of recommendation attesting to their competency in both skiing and mountaineering. This was the only time in the nation’s history when a civilian sports agency presented, screened, and accepted recruits for the military. By mid-1944, they had approved over 7000 such applications. After the attack on Pearl Harbor in December 1941, the Battalion swelled with recruits. The Army decided to add another two battalions for the regiment in May and June 1942. To cap off their initial training, the 87th Regiment launched an expedition to climb Mt. Rainier in May 1942, the first time such a feat was tried on that scale in the US. The remainder of 1942 was a busy time for the 87th Regiment. A group of men were sent to the Canadian Rockies to test various types of snow vehicles, chiefly the Studebaker ‘Weasel’. The US Army established the Mountain Training Center (MTC) and a cadre of 100 top skiers and mountaineers from the 87th become instructors. The 10th Cavalry Recon and 126th Mountain Engineer Battalion were both activated and attached to the 87th Regiment. The 126th Mountain Engineers began constructing aerial trams to speedily move men, casualties, and equipment from peak to peak, as well as testing ways to rapidly construct suspension bridges in the field. In November 1942 the construction of Camp Hale, Colorado was complete and became the home of the new MTC, and the 87th Regiment also moved there. The 601st Field Artillery Battalion (Pack) followed later to be attached to the 87th. A second regiment, the 86th Mountain Infantry Regiment, was made active, but they only have funding for a single battalion. Though lacking funding, the MTC was still swelling in size, with recruits and provisional battalions to house them. The MTC also hosted the 99th Infantry Battalion (Norwegian) for training during the winter. The opening months of 1943 also saw vast change, the 602nd Field Artillery Battalion (Pack) moved to the MTC and the 2nd and 3rd Battalions for the 86th Regiment were official authorized. Minot Dole also inspected the camp and expressed concerns about the morale of the command as well as the high daily sick rate. The 10th Cavalry Recon was re-organized as a mechanized recon, with expert skiers and mountaineers replacing cavalrymen and vehicles replacing the horses. In June the 87th Regiment along with the 601st and 602nd Artillery Battalions shipped out to California and joined Amphibious Task Force 9 (ATF-9), to train as an amphibious assault force to recapture the Aleutian Island of Kiska from the Japanese. In mid-July, the 604th Field Artillery Battalion was transferred to Camp Hale from Camp Carson. Their commanding officer General Ruffner refused transport and had the battalion do a 170 mile road march on foot with pack mules. With the arrival of a third artillery battalion the 10th Light Infantry division was activated at full strength with the addition of the 85th Mountain Infantry and 90th (regular) Infantry Regiments and support battalions. As a light infantry division, the heavy weapons companies were ordered to disband; however the mortar sections were retained and attached to Regimental HQ. Various instruction teams were sent across the country to instruct other units on wilderness survival and rock climbing. The 87th departed California in July and sets up a bivouac on the Aleutian Island of Adak in preparation for an assault on the Japanese held island of Kiska. Tragically, in August, they suffered their first oversees death when Private Kenneth Hintze drowned during a landing exercise. On 15 August, the 87th and ATF-9 launched their assault on Kiska. 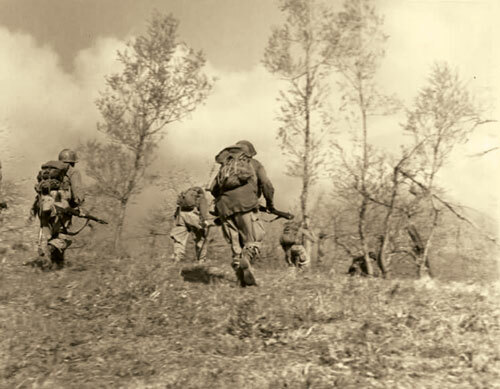 Through the morning fog, the 87th landed and rapidly ascended precipitous cliffs located at their LZ and occupied the ridge line to provide fire support for other units. Unknown to ATF -9 command the Japanese has used captured British SONAR equipment to navigate the US Naval blockade and slipped away. Despite the lack of opposition, ATF -9 lost 11 men to friendly fire and several others to exposure and enemy booby traps. The Navy also lost a destroyer when it collided with a mine, all hands on board were lost. Meanwhile, back in the States, Minot Dole and the NSP were authorized to recruit another 2000 men, to fill out the new regiments at the MTC. However, recruitment fell short and the Army fell back on more traditional ‘recruitment’ methods. Pfc. Tony Ragazzine (85-G) recalled that when he was in training in a tank destroyer unit, ‘At reveille one morning the non-coms were told to fall out and the rest of us were told we’d just volunteered for the ski troops.’ Several other men were recruited in a similar fashion from the 30th, 31st, and 33rd Divisions in Tennessee. The 87th returned to Camp Carson around Christmas and then to Camp Hale in mid-February 1943 where they joined the 10th Light Division and reorganized as a Light Infantry Regiment. 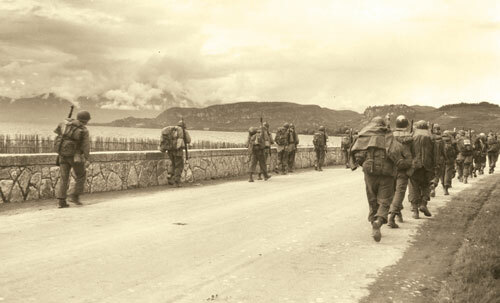 The 90th Infantry Regiment left Camp Hale, but the troops were given the option of remaining with the 10th, most stayed and joined other regiments. Between March and May, the 10th Light Division embarked on their D-series manoeuvres. These were designed to push the men, mules, and machines to their endurance limits in high altitude and prolong sub-zero exposure. The manoeuvres, while largely successful, did reveal some deficiencies with the light division structure. The Army Ground Forces recommended to Chief of Staff General Marshall that the 10th be reorganized as a regular division. In late June of 1944 the 10th Light Division left for Camp Swift in Texas to prepare for manoeuvres in Louisiana. However, these were cancelled as the Army was pre-occupied with the Normandy Campaign. Conflicting rumours abounded about where the division is going to be sent. Some units receive maps of Burma, while others receive Japanese language primers. In early July, the division is ordered on a ‘medical’ march of 10 miles in full gear in the Texas heat. The stated goal was to provide practice on the care and handling of injured soldiers with simulated wounds. Unfortunately, the march quickly turns into a real and unwanted exercise on the care of a large number of heat-exhausted soldiers. In November 1944, the 10th Light Division was official renamed the 10th Mountain Division and re-organized as a ‘Modified Triangular Division’ and the heavy weapons companies were re-authorized. 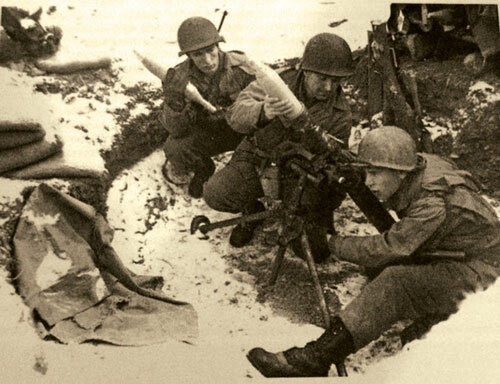 As a result of the 87th Regiment’s experience in the Aleutians, their D-level manoeuvres, and other field exercises, the division was authorized to replace the M1917 water-cooled HMG in their Weapons Companies with air-cooled tripod M2 .50 cal machine-guns. The division’s discovered that in prolonged exposure to extreme cold temperatures and altitude, the water jacket and tank of the M1917 would freeze making its use ineffective until warmed up. Also, the water tanks were cumbersome and hazardous to move while scaling mountains. The one glaring hole in their reorganization, and one that would plague them for the rest of the war, was that their divisional artillery only had 75mm pack howitzers. They lacked the 155mm guns to classify them as a true infantry division. 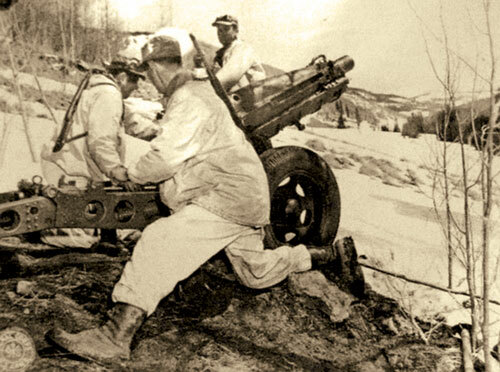 The 727th Anti-aircraft Artillery Machine-Gun battalion and 576th Anti-tank Battery joined the division and were combined to form the 10th Mountain Infantry Anti-tank Battalion. While they were armed with 57mm anti-tank guns and a mixture of M2 .50 cal AA MGs and the M49 quad .50 cal AA MGs, due to a lack of both German air and armour units in their deployment area, they fought on foot as a rifle battalion. The 10th Mountain Cavalry Recon was re-activated and mounted on horses (as it would be in Italy). Brigadier General (soon to be Major General) George P. Hayes was named divisional commander. He inspected his new division, had a personal meeting with the division’s officers and non-commissioned officers ‘for them to inspect him’, and prepared the division to leave for Italy. In December 1944, the division began moving piecemeal first to Virginia, then to Naples, Italy. The ‘Mountain Rocker’ Divisional patch was authorized at this point, but not actually issued until May of 1945. By mid-January 1945, the rest of the division arrived in Italy. Though the division was promised regular M2A1 105mm howitzers, these arrived at Fort Swift while the division was at sea and were re-assigned. To make up for this, US Fifth Army command attached the 1125th Armored Field Artillery Battalion (Independent) and the British 178th Medium Regiment, Royal Artillery to them, providing them with a total of five batteries of light and medium artillery directly under their command. The Fifth Army also put them at the top of priority to receive fire missions from the IV Corps level artillery pool. 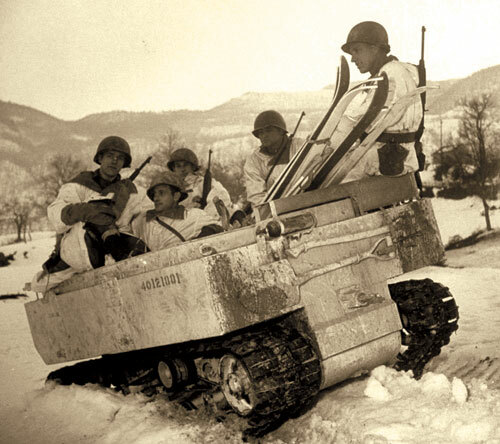 On 9 January 1945, the 86th Regiment, 10th Mountain Division (the first to arrive in Italy) was deployed on the line in the Monte Belvedere area, relieving Task Force 45. The 86th was protected on their Right flank by the 1st Brazilian Division (a position they would share throughout the rest of the war) and 25 miles of open mountain range on their left until the next Allied unit. Over the next few days General Hays travelled to Fifth Army command and conferred with Lt. General L.K. Truscott Jr. The capture of Monte Belvedere was important because it provided an excellent observation post for the German spotters all along Route 64, one of two main approaches to the Po River valley in the Fifth Army sector. General Hays, briefly studied the map and declared that such and assault on Mt. Belvedere would be suicide without first removing the German position on ‘Riva Ridge’ (A code name for the ridge that, from north to south, includes peaks called Pizzo di Campiano, Monte Cappel Buso, Monte Serrasiccia, Monte Riva, Monte Mancinello, and Le Piagge), as these positions had a clear view of Monte Belvedere. Throughout the remainder of January, the rest of the division arrived on the line. 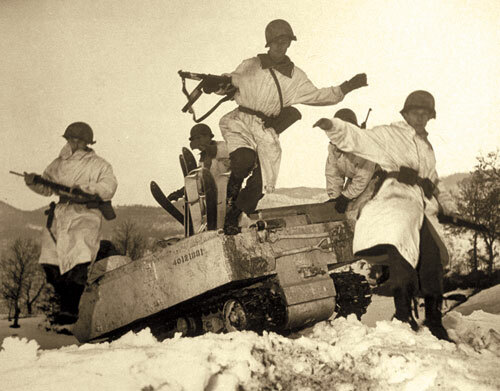 The 10th Division’s recon units performed exceptionally well with their white jump suits and skis. The 86th Regiment was pulled from the line for more training as over 30% of their men were pulled as ‘volunteers’ from other units. They receive a two week crash course in mountaineering and intense combat drills. They were to form the vanguard of the coming assault on Riva Ridge. 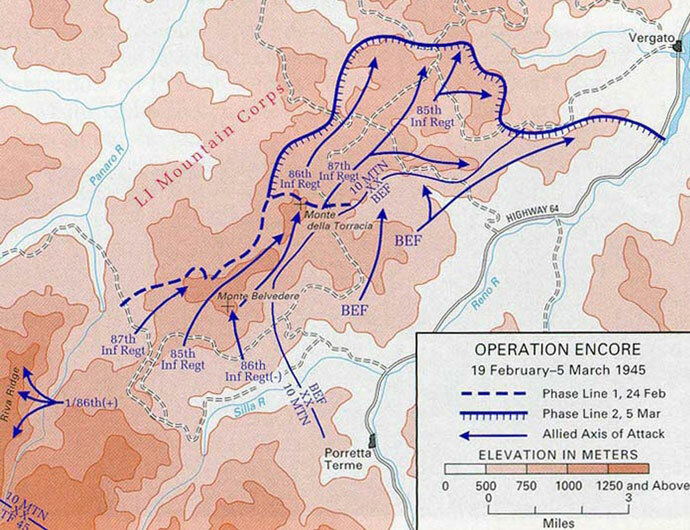 On the evening of 18 February, the 1st Battalion, 86th Mountain Infantry Regiment, along with F Company of the 2nd Battalion began the attack by making a daring night ascent up Riva Ridge. The ridge rises sharply from 1200 to 2000 feet above the rushing Derdagna River. The assault used five prepared routes, which included two that required fixed ropes. By dawn, the assault had achieved complete surprise and the ridge line was captured with only a single casualty. German response was quick and ferocious and put the capture of the ridge line in jeopardy. The fighting lasted for eight days before the German opposition was eliminated. On the 21 February, Company D of the 126th Mountain Engineer Battalion completed an aerial tram near the peak of Monte Cappel Buso. In the first day of operation, the tram delivered over 5-tons of supplies and evacuated 30 wounded. Riva Ridge was finally captured on 25 February and cost the division 76 casualties: 21 KIA, 52 WIA, and 3 POW. At 2300 hours on 19 February, the remainder of the division began their assault of Monte Belvedere and its sister peak Monte Gorgolesco. Without any artillery preparation and the General’s orders ‘Fix Bayonets! Move Out!’ they advanced. The 87th Regiment formed the left flank, with the 2nd Battalion advancing on the fortified villages of Polla and Corona, and the 1st Battalion securing the western sloped of Monte Belvedere. 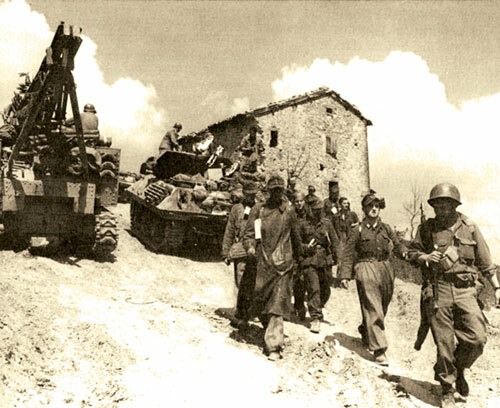 The 3rd Battalion of the 85th Regiment headed for the summit of Monte Belvedere and the 1st Battalion headed to take Monte Gorgolesco. The 3rd Battalion, 86th Regiment moved along the ridge to take Mazzancana. The rest of the Division (two battalions) remained in reserve. By the morning of 20 February, the initial assault has succeeded and the division had achieved their objectives. 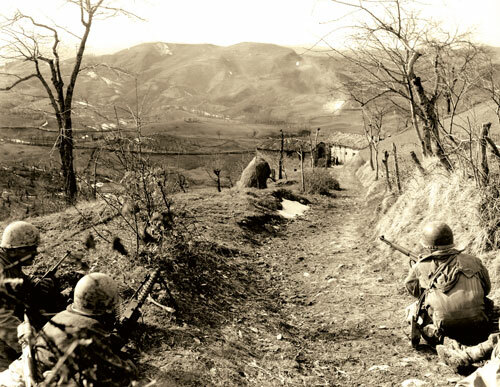 The 1st Battalion, 85th Regiment pressed their attack North East to the slopes of Monte Gorgolesco. 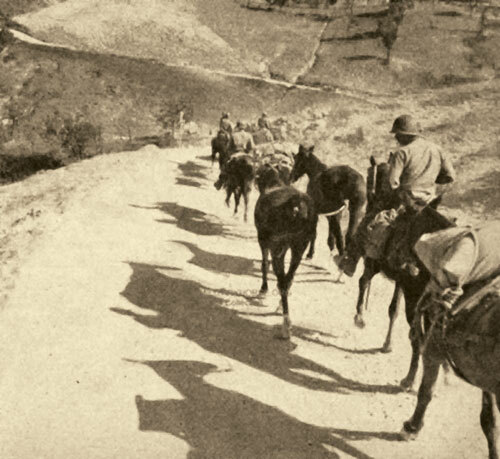 Late in the afternoon, the 85th Regiment’s 2nd Battalion passed through the 1st Battalion and started the attack on the division’s final opening objective, Monte della Torracca. By 2100 hours, they had captured Hill 1027, a narrow ridge leading to the peak of Monte della Torracca. The following day, the Brazilians captured Monte Castello, securing the division’s right flank. During the following days, German artillery fire was heavy and caused numerous casualties to the 2nd Battalion, 85th Regiment. The 3rd Battalion, 86th Regiment finally captured the summit of Monte della Torraca on 24 February. The final German counterattacks were cleaned up on the following day. The Monte Belvedere portion of the operation caused the division 923 casualties: 192 KIA, 730 WIA, and 1 POW. After a brief rest, the division and the Fifth Army next thrust into the Po Valley. General Truscott believed that this will serve as a jump off point for the Fifth Army to secure the Northern part of the Po Valley. However, his assault was buffeted by stiff German resistance. The 10th Mountain Division was called on to capture the crossroads town of Castel d’Aiano and Monte della Spe. The attack cut the German supply and communication lines and allowed the Fifth Army to take full control of Route 64 to within 15 miles of the Po Valley. It also allowed the 1st Armored Division (which had been in reserve all winter) to pull up to the 10th Division’s right flank. However, once in these positions the division has to endure two weeks of intense shelling and counterattacks before the Germans were neutralized. 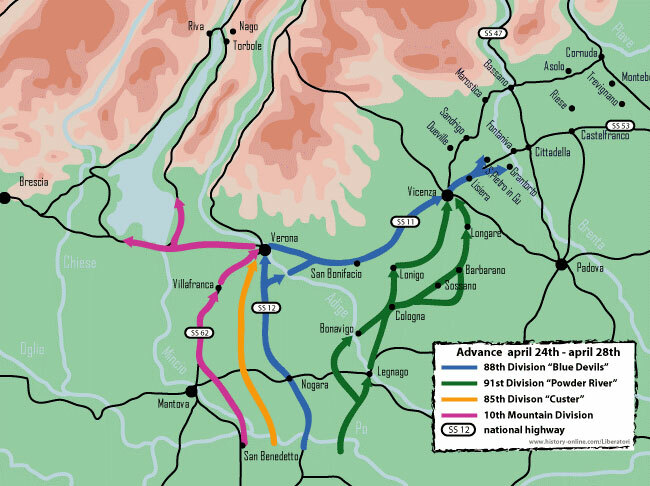 On 14 April, the Fifth Army launches its Spring Offensive and the 10th Mountain Division attacks 24 hours before the rest of the Allied forces. They launched an assault on the German occupied hills north of Monte della Spe, but this attack did not take the Germans by surprise. Despite extensive preparatory bombardments and air strikes, the division has its bloodiest single day in combat. Lieutenant (later Senator) Robert Dole was seriously injured and Private First Class John Magrath was awarded the divisions only Congressional Medal of Honor after single-handedly knocking out four German machine-guns on Hill 909 and then volunteering for another mission during which he is killed by mortar fire. The next day, the division cleared the town of Tole, which freed the 1st Armored Division to clear the rest of the Samoggia River Valley. The Fifth Army and their Allies were on the doorstep of seizing the Po Valley, though these 3 days of fighting were costliest 3 days of the war for the division with 1336 casualties: 286 KIA, 1047 WIA, and 3 POW. During the remainder of April, the 10th Mountain Division along with the rest of the Fifth Army pressed forward into the Po Valley. On 23 April, at 1200 hours, A Company of the 87th Regiment was the first Allied unit to cross the Po River and establish a beach head. The rest of the month saw the various elements of the 10th Mountain Division assigned to Task Forces to secure the rest of the valley. With the German army in full retreat, on 30 April, a Task Force consisting of elements of the 10th Division enters the village of Torbole on the North end of Lake Garda. The Task Force column came under artillery fire and Colonel Darby was killed while at the head of the column. The same day, another Task Force consisting of the elements of the 85th Regiment crossed the lake in DUKW trucks and seizes Mussolini’s Villa and offices in Gargano. The following day, the remainder of the 85th Regiment crossed the lake in DUKWs and the German Army in Italy formally surrenders. The 10th Mountain Division moved into the Alps on the border with Austria and meets elements of the US 44th Division heading south to sweep the area for German holdouts. On 20 May the division moved to Trieste and joined the British Eighth Army to contain Tito’s Soviet backed Yugoslavian forces. 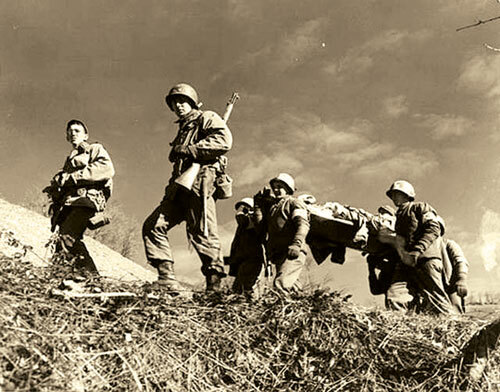 That turned out to be the end of the war for the men of the 10th Mountain Division. 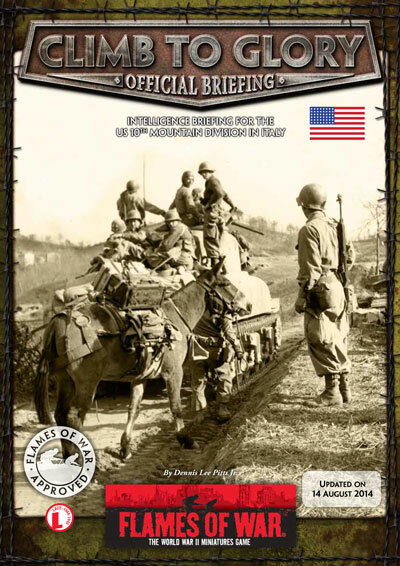 In mid-July, the division was recalled to the US to prepare to fight the Japanese. In early August, with most of the division at sea, the bomb was dropped on Hiroshima, then Nagasaki a few days later, followed by the surrender of Japan on 15 August 1945. The troopers of the division were given a 30 day leave and ordered to return to Cape Hale, Colorado on 15 September. The division was deactivated on 30 November 1945. During its brief four months in combat, the division suffered 4866 casualties: 975 KIA, 3871 WIA, and 20 POW. The division suffered a total of 25% of its strength in casualties and an average of 1216 per month during period it was in combat (the highest per month average in the Italian Command). The division would remain deactivated until the 1980s when the Mountain Training Group was moved to Fort Drum, New York and training began for a possible deployment to Afghanistan to fight the Soviet occupation. You can field a company from the US 10th Mountain Division using the Cimb to Glory Intelligence Briefing.